Keeping a strong lower body is so important for pregnancy. Not only does it help to support the change of balance and extra stress from carrying the baby, but it can also help during labor. Squatting is one of the most effective positions for birth (as gravity works with you, instead of against you) so it’s a good idea to practice this move and build strength to support your hips and knees. 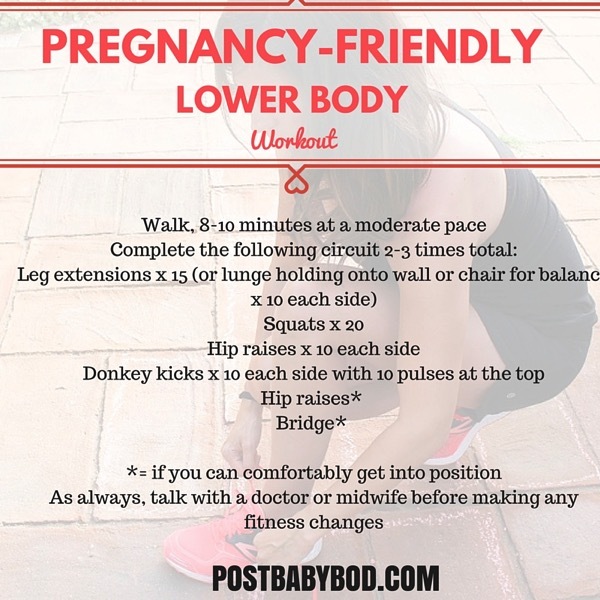 Here is a pregnancy-friendly lower body workout. As always, check with a doctor or midwife before making any fitness changes. Also, if you didn’t do it before, pregnancy is not the time to begin (unless we’re talking about a walking routine with a doc’s ok). Make sure that you’re comfortable with the movements before including it in your pregnancy fitness routine. Leg extensions or lunges holding onto a chair or wall for balance: make sure that if you’re using the leg extension machine that the lever is in line with your knee joint. If you decide to do lunges instead, make sure your legs are hip-width apart and that you hold onto a chair or the wall for balance if you need it. Sink straight down instead of forward, keeping the chest lifted and exhale as you rise. Squats: you may have to take a wider stance to make room for baby. Keep hips down and back as you keep your chest lifted. Exhale to rise. Donkey kicks: start on hands and knees with your hands under your shoulders and knees under your hips. Lift one leg off the floor, keeping a 90 degree bend, and keeping both hips parallel to the floor. Lower down with control and exhale to lift. Keep your core pulled in and use your glutes (not momentum) to lift your leg. Hip raises**: this is one of my favorite glute strengtheners! Keep both hips facing forward as you contract the glutes to lift one leg off the floor. With control, lower down and repeat. **For your hip raises and bridges, you’ll need to come onto the floor. If you are too uncomfortable, and unable to get up and down off the floor without major acrobatics/discomfort. Skip these! What’s your favorite pregnancy-friendly exercise move? Is there anything my fellow mamas can say helped them with the active work of labor? It was really important for me to have small snacks here and there since my midwives allowed it. Coconut was a major help (chocolate Zico, of course) and energy gummies.